Lost: Jack keeps comparing Kate to Juliet and Sarah. By the time he makes up his mind..
Lost: December 2007 contest 1st place winner! Lost: Kate/Jack/Sawyer Flash Forward. What the world takes it also gives back. More on youtube. Special thanks to Kat for getting me some very important clips! Lost: Ever since it happened, Kate hasn't been able to move on. She's been miserable, she's been heartbroken, she can't get over what she's done. How could she have let it happen? Lost: Ben is a well-known actor, director and music producer. Juliet is at first swept away by him but she starts to learn that he isn't what he appears to be. Lost: Slightly AU. Charlies brief moment in the rock n roll spotlight went to his head somewhat and for a while he fancied himself somewhat of a ladies man. After the crash, however, he realizes that he's actually intended for one little lady in particular. Lost: December 2007 contest 2nd place winner! Shannon, Kate, Sun, Claire & Penny want a visit from Santa. Lost: My 1st lost vid that I'm truly proud of. Ben and The Others/Hostiles Theme Song. This was fun to make. Some little inside jokes/associations for Lost fans. Humorous. Lost: December 2007 Contest Submission. Sawyer is Santa Claus and has to deal with a lot of problems. Lost: December 2007 contest submission. 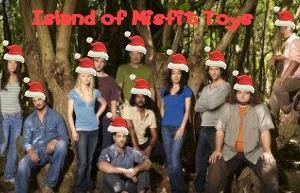 Christmas with the Losties on The Island of Misfit Toys.